Atlanta’s second-round draft selection, Isaiah Oliver, steps in to a favorable situation to provide depth behind current starters Desmond Trufant and Robert Alford in the up-and-coming Falcons defense. Last season, the Falcons defense ranked fifth in overall grade as a unit at 87.7 improving from 15th in 2016 (75.2). Oliver has the body type that NFL teams covet in 2017, with the size and speed to be able to play man coverage on the outside and challenge for any deep ball. Oliver allowed fewer than 44 percent of his targets to be caught in each of his past two seasons, and he finished his collegiate career with 23 passes defensed and three interceptions. Combining his impressive radius to challenge for the ball, and his steady improvement during each season at Colorado, Oliver has the potential to be an impact player in his first NFL season. With the first pick of the fourth round the Panthers opted for Indiana’s standout tight end, Ian Thomas. Thomas joins a tight end group lacking depth behind all-pro Greg Olsen who is entering his 12th year and coming off an injury plagued 2017 season. Behind Olsen, other tight ends on the roster have been unimpressive for the Panthers in recent years, as no player has graded above 65.0 since 2011. An athletic tight end, Thomas can create mismatches on the outside and he averaged 8.9 yards after the catch per reception despite not forcing a missed tackle on his 29 career receptions. Playing just 646 offensive snaps in his Hoosiers career, Thomas is inexperienced, but he has all of the tools needed to have significant success at the NFL level. The release of wideout Brandon Coleman provides Smith with an opportunity to move up the depth chart quickly behind rising superstar Michael Thomas. Smith broke out as a big-play threat in 2017, averaging 19.2 yards per catch and hauling in 14 touchdowns. He has good size and body control and he uses his long strides to gain ground and separate from cornerbacks down the field. He also has the toughness to make plays over the middle of the field and the speed to succeed as a vertical slot option, much like he did at UCF, while also adding value when lined up on the outside. Smith’s production in 2017 was almost unmatched as he caught 70.8 percent of his deep targets, second-best in the nation, and he led all FBS receivers with nine touchdowns on deep passes. He was the go-to guy for the Knights, with 55.4 percent of his receptions going for a first down or a touchdown, second-best among draft-eligible receivers a season ago. 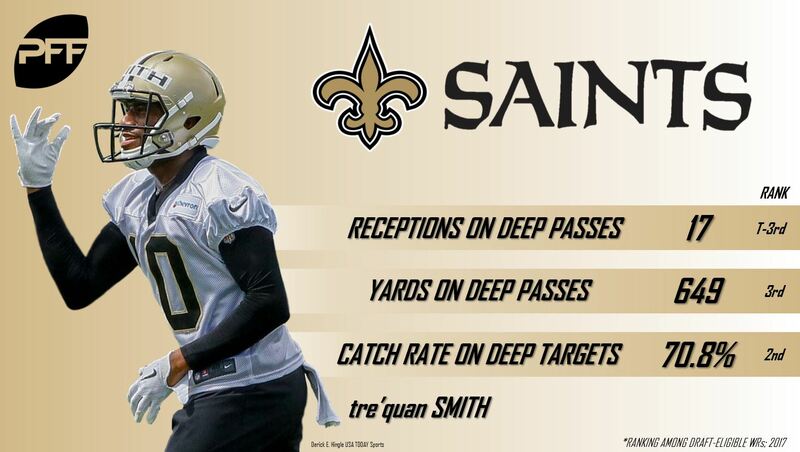 Besides Thomas, no other Saints wide receiver generated a 70.0 receiving grade in 2017, so if Smith can show he’s a reliable target throughout the preseason, his rookie impact could be huge as a third or fourth option behind Thomas and premier receiving running back, Alvin Kamara. The Tampa Bay rushing attack was uninspiring in 2017, as the team ranked 30th in the league with a 58.5 overall rushing grade. This provides a great opportunity for second-round pick Ronald Jones II to step in and shoot up the depth chart. Jones was the highest-graded running back in the nation in 2017. Last season, the rookie averaged 3.5 yards per carry after contact, gaining 743 yards after first contact, and he broke 50 tackles on 212 carries. His 76.4 elusive rating ranked 12th among draft-eligible RBs which should open some eyes in Tampa Bay as no running back on the roster ranked in the top-20 in elusiveness rating last season. Peyton Barber led the Buccaneers with 15 forced missed tackles in 2017, but he only produced a 31.4 elusive rating, 48th best among RBs with a minimum of 50 rushing attempts. Jones’ ability to play in the passing game is more of an unknown, as he saw very few targets, but he did perform solidly as a pass protector and caught the ball well when it did come his way. 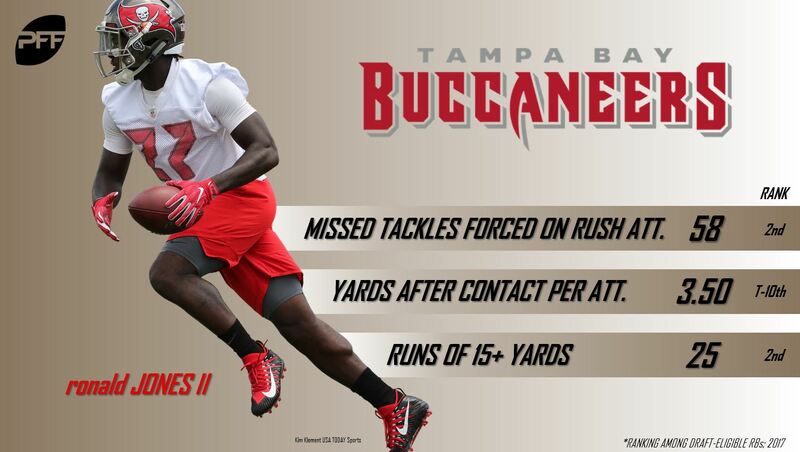 Jones II is a player to watch this preseason.